Better by a Touch? Apple slims down the MacBook Pro 15 quite radically and reduces the weight to around 1.8 kg with a thickness of just 16 millimeters. The professional notebook, which even gained customers from the 17-inch Pro in the past, is now even a real alternative for users of the previous MBP 13. Apple is expected to unveil an updated MacBook Pro line-up in June, so if you can wait, you should as you'll likely get better specs for the same money, or get the 2016 model on a slight discount. The Touch Bar is very much the poor cousin of a proper touchscreen, the lack of ports is very much style over substance – and let’s not forget that it's both late and about to be superseded. We expected more from you, Apple. 70% Apple MacBook Pro 15-inch (Touch Bar) Review: Is It Good for Business? The Touch Bar isn't perfect – it can seem gimmicky and even be downright confusing at times. Still, I think it has plenty of potential, especially once you get past the initial learning curve. It won't revolutionize your workflow, but it could save you from hunting through menus while you work. With a slim bezel around its 15-inch screen and a thinner, lighter body, the top-end MacBook Pro packs a real visual punch. But if you miss the traditional HDMI and USB ports, consider the older 2015 model that Apple still sells. Apple MacBook Pro 15-Inch With Touch Bar (Late 2016) Review: Is It Worth The Price? Is it worth it? Yes, if you can get a discount (decent discounts aren’t hard to find, though you have to be vigilant and have some patience). I believe Apple still makes the best laptops on the planet and the MBP 15 Touch Bar is the pinnacle of Apple’s MacBook line. With its solid feel, bold screen, clean lines, giant touch pad, and svelte frame, Apple's new MacBook Pro 15-inch is a very good light laptop, with solid (though sometimes unpredictable) battery life that eclipses most of the big-screen competition. If you've been waiting for a thin-and-light premium powerhouse, it's well worth considering. You can certainly buy more powerful workstation-grade Windows laptops with more memory, but their design and portability won't match up well to the MacBook Pro, and their unplugged longevity will almost certainly be shorter. It’s thin, light and very fast, but also so expensive that it’s in danger of pricing out even the professionals. There’s no denying that the 15in MacBook Pro is a flawed device. Its battery life is much weaker than expected, its choice of connections means you need to buy adapters, and its headline-grabbing new Touch Bar just isn’t that useful right now. Mostly though, the MacBook Pro is a supreme notebooks that you won’t mind spending good money on because they’ll be companions for years. Want to know the only thing we really don’t like? The Apple logo on the lid no longer lights up. That’s a sadness. But USB-C and the Touch Bar? That’s welcome progress. You can rely on its big and gorgeous screen more than any other MacBook in history. The ability to hook up three 4K monitors or two 5K panels feels like a bonus more than anything – and even if you did that, you would still want to use the MacBook's screen for its incredible luminosity. That said, if you're still nursing a 2011 MacBook/MacBook Pro, or are moving up from a 12 or 13 inch Mac, there's certainly stuff to enjoy here: dedicated graphics, faster performance with double the CPU cores, a roomier display and a relatively portable package. If you're upgrading from a previous generation 13" MacBook Pro, the 15" MacBook Pro will be heavenly in all but footprint and weight (though miraculously, it's only a half pound heavier than the last gen 13" Pro). The display is brighter and more colorful than ever, and the design and looks are beyond reproach. As ever, OS X is stable and intuitive and Apple's support on the phone and at the Genius Bar is better than most Windows PC makers' support. That’s not to say Apple’s new MacBook Pro isn’t good, because it is. You just have to be prepared for Apple’s future of computing, which is very much in its infancy. Even if you don’t jump on the new Pro, you should start preparing now, because a dongle-filled future is coming whether you like it or not. 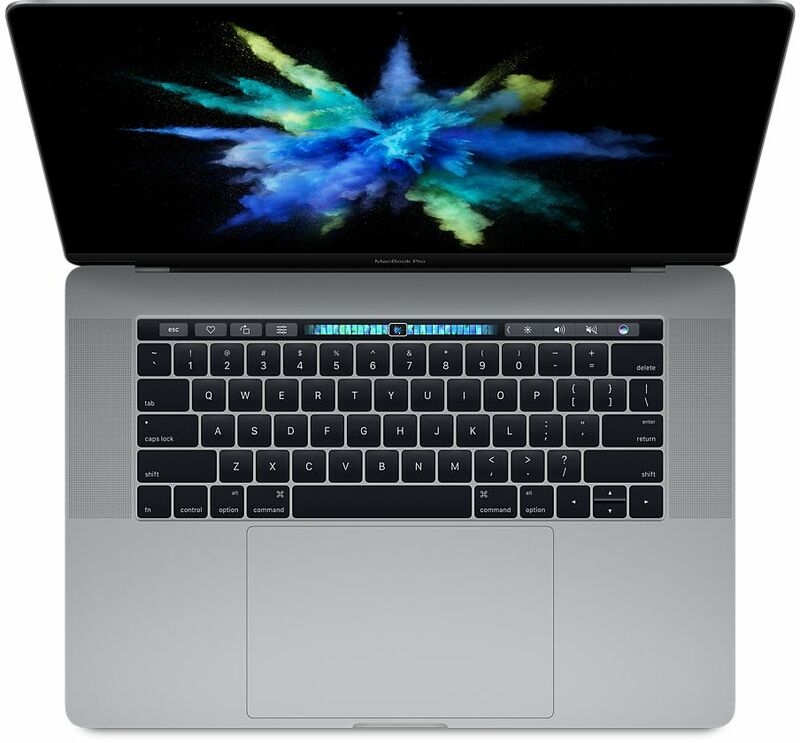 My biggest point of contention with this year's line-up has been that I thought Apple skimped on storage and RAM while boosting the entry price for the MacBook Pros with Touch Bar. I felt Apple was nickel and diming its customers, especially considering the company's average profit margins (over 38% last quarter). 80% MacBook Pro with Touch Bar review: A touch of brilliance or totally brainless? The MacBook Pro has lots of things going for it. We love the keyboard, the trackpad, the screen, the performance, and the inclusion of the Touch ID sensor. While the $2,130 Dell XPS 15 Touch has better legacy connectivity with USB 3.0 and HDMI, and a higher-resolution 4K screen with a slightly wider color gamut, that won't do you any good when you run out of juice 5 hours earlier in a long workday. The fact that you have to buy new adapters for external displays or drives may give you pause, but the industry is catching up, and finally, Thunderbolt no longer means "Mac-only." You'll be ahead of the game with the 15-inch MacBook Pro, which replaces the Dell XPS 15 Touch as our latest Editors' Choice for high-end desktop-replacement laptops. So who says there’s nothing new under the sun? Here’s a new dimension added to the Mac, with a debt owed to iOS, but undeniably its own approach. It never forgets it’s a companion to the keyboard and trackpad, but adds more flexibility than a static keyboard ever could. I’m looking forward to seeing how it evolves—and I have to admit, I kind of want one to place above the top row of my own external Mac keyboard now. I never felt that way about function keys. The MacBook Pro with Touch Bar is the first major laptop that tries to replicate that dream — not with individually reprogrammable keys, but with a thin touchscreen strip that can do even more. It adds touchscreen buttons and ever-changing digital controls to the familiar set of physical keys, and it has the potential to remake the keyboard in a way we've never seen before. Is the Touch Bar worth a gamble? It’s an expensive gamble to make, and I think that anyone except the utterly faithful should wait six months to see how the ecosystem react. Windows PCs have undergone huge transformations over the past several years: they’ve gained touchscreens, the ability to bend and twist, and many can pull double duty as tablets. Apple’s MacBooks haven’t changed nearly as dramatically — using an Apple laptop built in 2015 is largely the same as using one from 2010. The MacBook Pro with Touch Bar offers a slew of neat touch controls, a beautifully slim design and the most blazing performance you can find on a Mac. Apple's MacBook Pro has long been the go-to laptop for the media creation set. But with this week's upgrade, the laptop gets more powerful internals, a new chassis, MacBook-like butterfly switches for the keyboard, and USB-C/Thunderbolt 3, in addition to the unique Touch Bar above the keyboard. The Apple faithful will likely be eager to upgrade, though they might need to budget a few extra bucks for adapters. Opt for the 15-inch MacBook Pro, meanwhile, and that starts at $2,399. That comes with a 2.6GHz quad-core Core i7, 16GB of memory, a 256GB SSD, and AMD’s 2GB Radeon Pro 450 graphics. Throw the contents of your wallet at the configurator, and you can end up with a 2.9GHz quad-core Core i7, 16GB of memory, 2TB of SSD, and a 4GB Radeon Pro 460. You’ll also be $4,299 poorer. It seems like this MacBook hasn't really moved on, but tiny tweaks ensure it's still a great machine. After all, the mid-2015 model can't be considered ot innovative by Apple's standards, but the largest of Apple's notebooks is still a stunning Mac and a total powerhouse in general. O destaque real do novo MacBook Pro é a Touch Bar. Ela é um pouco útil, mas possui tão pouco suporte em apps de terceiros que, pelo menos por enquanto, não é razão suficiente para comprar um laptop novo, particularmente se você já está satisfeito com o desempenho de sua máquina atual. Positive: Flexible fingerprint sensor; impressive touch bar; high performance. Kann Apple mit der "Touch Bar" punkten? 89% Apple MacBook Pro 2016 im ersten Test: Ja, aber! Positive: Impressive touch bar; flexible fingerprint sensor; long battery life; good display; decent speakers. Positive: Compact size; solid workmanship; fast system; comfortable keyboard; excellent screen; good speakers. Negative: High price; low autonomy. Positive: Impressive design; slim size and lightweight; smart Touch Bar. Negative: High price; a poor set of ports. Positive: Beautiful design; powerful hardware; high performance; nice display. Negative: Short battery life; few ports; uncomfortable keyboard. Positive: Beautiful design; compact size; attractive Touch Bar. Negative: Few ports; high price. Positive: Good touchpad; excellent speakers. Negative: Low performance; overheats while using; mediocre design. Positive: Nice display; beautiful design; good ergonomy. Negative: High price. Positive: Nice screen; high performance. Negative: High price. Positive: High performance; long battery life; slim size; lightweight. Negative: High price. Positive: High performance; high quality large display; high autonomy; flexible fingerprint sensor. Negative: High price; a limited set of ports. Positive: Slim size; impressive touch bar; attractive touch ID. Negative: Mediocre trackpad; high price. AMD Radeon Pro 450: Mobile GPU based on Polaris 11 that is found in the entry-level Apple MacBook Pro 15-inch Late 2016. Probably a slimmed-down version of the Radeon RX 460 (clocks and possibly shader count). With these GPUs you are able to play modern and demanding games fluently at medium detail settings and HD resolution. » Further information can be found in our Comparison of Mobile Graphics Cards and the corresponding Benchmark List. 82.21%: This rating should be considered to be average. This is because the proportion of notebooks which have a higher rating is approximately equal to the proportion which have a lower rating.